Oil sands are a mixture of sand, water, clay and bitumen found in several locations around the globe, with the largest reserve located in Alberta, Canada. Oil sand can be upgraded into synthetic crude oil and other petroleum products Alberta Energy. What is Oil Sands? (2015). Retrieved from http://www.energy.gov.ab.ca/oilsands/793.asp Alberta Energy. What is Oil Sands? (2015). Retrieved from http://www.energy.gov.ab.ca/oilsands/793.asp Alberta Energy. What is Oil Sands? (2015). Retrieved from http://www.energy.gov.ab.ca/oilsands/793.asp Alberta Energy. What is Oil Sands? (2015). Retrieved from http://www.energy.gov.ab.ca/oilsands/793.asp Alberta Energy. What is Oil Sands? (2015). Retrieved from http://www.energy.gov.ab.ca/oilsands/793.asp . There are two different methods of producing oil from oil sands: open-pit mining and in situ. Bitumen that is close to the surface (less than 75 metres) is mined. 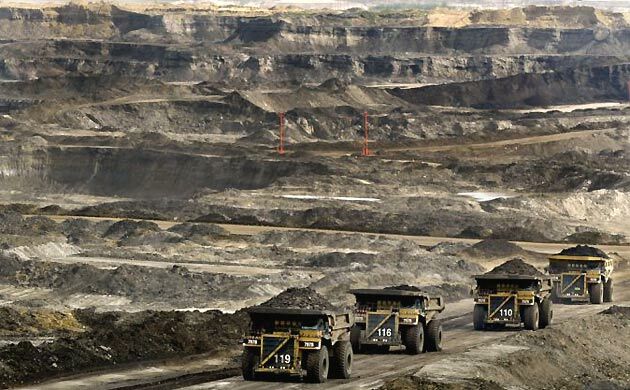 Approximately 20% of oil sands are recoverable through open-pit mining. Bitumen is extremely thick and too heavy to flow or be pumped, and therefore requires dilution and/or heating during the production process. Open pit mining is similar to coal mining operations – large shovels scoop the oil sand into trucks that then take it to crushers where the large clumps of earth are broken down. This mixture is then mixed with water to form a slurry that is transported to a plant, where the bitumen is separated from the other components in a froth process. Bitumen normally undergoes a process called upgrading to create synthetic oil that can be refined. In general, unconventional forms of oil including oil sands mining are becoming important in global energy supply due to decreasing reserves of conventional oil. For the Canadian oil sands, debate continues over the industry’s environmental impacts and capacity for export. The International Energy Agency has warned that expanding Canadian production hinges on transportation capacity Hussain, Yadullah, (2014). Financial Post. Retrieved from http://business.financialpost.com/news/energy/new-emissions-from-canadas-oil-sands-extremely-low-says-ieas-chief-economist?__lsa=bfcb-b3b5 Hussain, Yadullah, (2014). Financial Post. Retrieved from http://business.financialpost.com/news/energy/new-emissions-from-canadas-oil-sands-extremely-low-says-ieas-chief-economist?__lsa=bfcb-b3b5 Hussain, Yadullah, (2014). Financial Post. Retrieved from http://business.financialpost.com/news/energy/new-emissions-from-canadas-oil-sands-extremely-low-says-ieas-chief-economist?__lsa=bfcb-b3b5 Hussain, Yadullah, (2014). Financial Post. Retrieved from http://business.financialpost.com/news/energy/new-emissions-from-canadas-oil-sands-extremely-low-says-ieas-chief-economist?__lsa=bfcb-b3b5 Hussain, Yadullah, (2014). Financial Post. Retrieved from http://business.financialpost.com/news/energy/new-emissions-from-canadas-oil-sands-extremely-low-says-ieas-chief-economist?__lsa=bfcb-b3b5 . Environmental concerns regarding oil sands mining focus on the toxic waste byproduct of the extraction process and land disturbance. After the sand is brought to an extraction plant, it undertakes a dilution process in which it is mixed with hot water and chemicals so that it may flow freely into pipelines. The water that cannot be recycled is contained in tailings ponds, where the thick sediment emits toxins. Additionally, as with all mining, there are significant land disturbances. Sorry, we do not yet have a video specifically for Oil Sands Mining. We are adding new videos to StudentEnergy.org weekly, but in the meantime check out this video on Oil Sands.